Are you a health conscious person who hit the gym regularly? Well, I'm not exactly a health conscious person, but I do go to the gym regularly to workout every now and then because I'm quite a vain person. I want a lithe and toned body that is admired by many. Working out is proven to be quite a difficult task for a person who lacks discipline like me. More often than not, I find that it is difficult to focus on my gym routine because I feel tired easily. 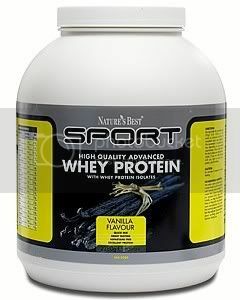 My personal trainer was rather concerned about me, and therefore, he suggested that I consume Nature's Best whey protein to boost up my energy during those rigorous workout sessions. I was reluctant to try it in the beginning because I was not familiar with it, but I was informed that whey protein is important for active individuals who exercise a lot as it is made of high quality protein powder made from cow’s milk and is often referred to as the gold standard of protein as it is the most nutritious protein available.Whey protein is a high quality, complete protein, with all the essential amino acids and is also the richest known source of naturally occurring branched chain amino acids. After a lot of coaxing and coercing from my personal trainer, I finally tried whey protein and I discovered that it's really helpful in providing me all the energy that I need to stay focus during my workout sessions. So, ladies and gentlemen, if you practise an active lifestyle and needs some supplements to provide you some extra boost, I daresay that whey protein is quite a safe bet. Do give it a try. I bet you would benefit from it the way that I did.